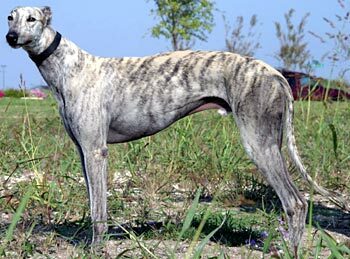 Faro, aka LRC Faro, is a handsome 2½-year-old light brindle male born April 18, 2006. His sire is Lonesome Cry, making his grand sire Gable Dodge, and his dam is Table Stakes. He is brother to Roulette. 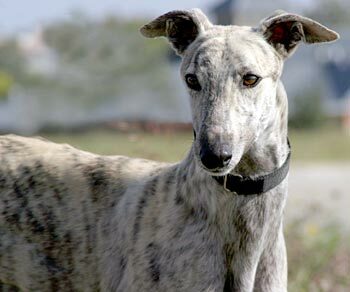 Faro has 23 races to his credit on Greyhound-data.com staring on December 27, 2007, at Gulf Greyhound Park in LaMarque, Texas, moving to Valley Race Park in Harlingen, TX, and finishing at Naples/Ft. Myers, FL, track on September 6, 2008. 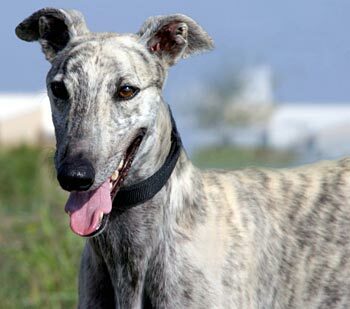 Faro is one sweet, loving greyhound that just wants to please his forever family. Faro is not cat or small animal tolerant. Faro came to me from another foster home, where he lived with another greyhound for about a month. On his daily rides up and down the elevators, he got pretty excited when he saw the little dogs that also lived in the apartment building, so he had to go to a new home without small dogs. Therefore, Faro needs to be an only dog or spend his days with dogs his size. He’s fine with big dogs, often a little overwhelmed. Faro is a sweetheart who loves to sleep all day. Running is fun for about a block, but being inside is even better. Rawhides are great, as is all food; but squeaky toys and balls tend to be ignored. If Faro can lie at your side and be loved, Faro is content. He’s pretty mellow for the most part. On occasion, he gets excited and sort of kicks out his legs like a horse. And when he’s tired and content, he sighs like one. He goes in his crate well, though in my apartment he usually has freedom to roam. He walks well on a leash, but is sometimes skittish and jumps at loud or strange noises. He just needs to be reassured that everything’s going to be fine.